Plumpton College provides a range of successful land-based Education and Training programmes in Further and Higher Education, up to Foundation Degree and BSc level. 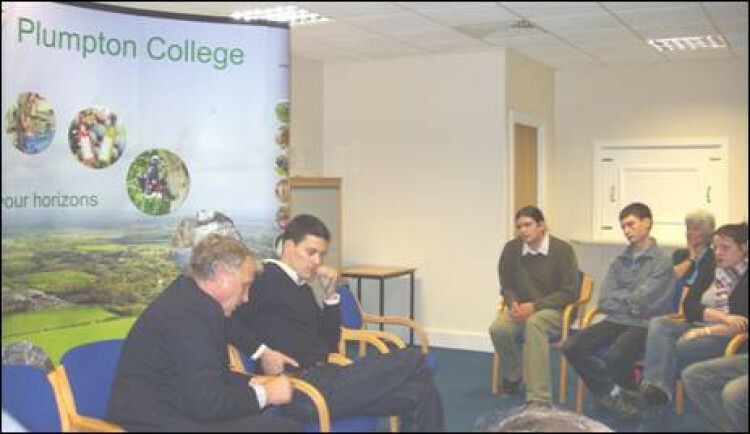 Plumpton College in East Sussex recently hosted a visit by David Miliband MP, Secretary of State for the Environment, Food and Rural Affairs, as part of his visit to Sussex to see various rural activities. The visit was co-ordinated by Shaun Leavey, (Chair of the South East Sustainable Farming and Food Board) and John Evans (Farm Business Advisor, Sussex Enterprise). The visit to Plumpton College included a visit to the College's large mixed commercial farm and a tour of the College's new winery. The large College estate provides a wide range of relevant practical and demonstration facilities for students in agriculture, countryside management, forestry and arboriculture, while the winery offers unique viticulture and oenology courses and the new winery building will provide specialist wine research laboratories, events rooms and teaching classrooms and laboratories. The Secretary of State then took many interesting and topical questions from the student audience in the College's Sussex Rural Business Centre. In an informal question and answer session, Mr Miliband discussed the changes that are necessary to tackle concerns over the many issues facing farming, the environment and rural employment. The Rt Hon David Miliband MP, Secretary of State for Environment, Food and Rural Affairs, visits Plumpton College on Friday 24 November 2006. He is pictured with Des Lambert, (Principal, Plumpton College) in discussion with students from Plumpton College.